Yesterday, I got to represent Save the Harbor/Save the Bay at the L Street Night event at the Curley Community Center. The L Street Night event was put in place to raise money for a playground that will be built in the area. 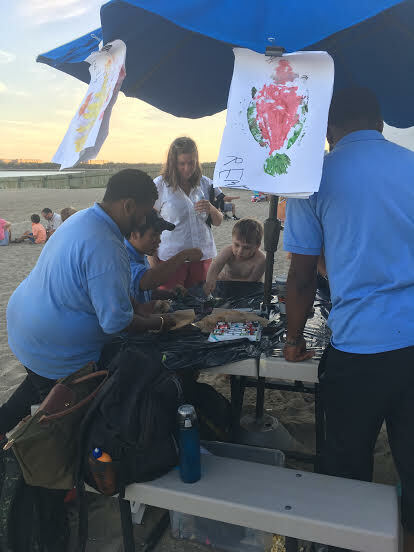 This event was catered to families and children, which made it a perfect place to fish print! When we arrived, there was a band playing and fresh popcorn being popped for all of the guests. Our table was located in the sand so we slipped off our shoes and began to set up. The sun sunk lower in the sky as families began to arrive. As our table was in the middle of the event, it was hard to miss. Soon enough, we had children running up to our table to learn more about fish printing. Younger siblings would make a print and then dart around to collect their older siblings to make one as well. A few kids were too excited to just stop at one fish print. Because we had a flounder and a fake flounder, we had quite a few kids who chose to do one of each. I don't think I will ever get over the shock in people's faces when they see that we have a real fish on the table. 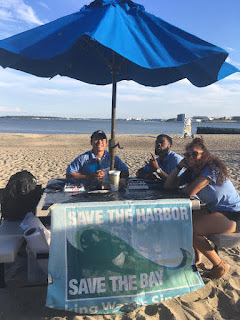 Many adults at the event were very interested in learning more about Save the Harbor/Save the Bay and all the work that we do for the community. I invited them all to join us for our free days at George's Island next week! I saw one family from the event on Spectacle Island today. This event was a great way for kids to make some amazing art, learn about flounder, and learn more about Save the Harbor/Save the Bay. Don't forget to sign up for our free days on George's Island!